Recent technological advancements have made the Cloud more accessible than ever. The convenience of having data stored in the Cloud makes it a must-use for most businesses. It creates the possibility of accessing files from anywhere, streamlining business processes because employees are not required to return to the office if a company file on another device is needed. While the Cloud makes it easier to store and share data, it makes files more vulnerable to threats since they are accessible from anywhere. Protecting data in the Cloud is essential for information stored in public servers instead of a company’s own. Cloud services such as Tresorit and McAfee are more secure than others, so users should research which one fits their company best before storing sensitive data. Cloud data centers are still suspect to breaches like any other server, so consider using a built-in encryption backup like SpiderOak or BitLocker when keeping information online. Since you lose control of who has access to files once they are stored in the Cloud, they need to be protected. Using built-in encryption software to secure files in addition to the digital backup will add a layer of defense to private data. Why Business Owners are Making a Server to Cloud Migration? Strong and varying passwords are critical when protecting data in the Cloud because most people have access to the Internet. With users creating several usernames and passwords for websites, programs, and files accessed daily, it is likely that passwords are recycled among various programs. This repetition makes it easier for a cybercriminal to guess passwords. Be sure to vary them and use special characters to make your files and accounts more difficult for hackers to breach. Using a password manager can be extremely helpful to remember these varying passwords, but beware that it is likely the first place a bad guy would go to obtain them. Encryption will also keep data stored in the Cloud secure. It scrambles files to make them unreadable by anyone who does not possess the encryption key or code to piece them back together. It could require a physical key to access the file, making it impossible for bad guys to open sensitive information. Data classification is a risk management system for deciding which files to keep online. It can be helpful to create a rating scale for determining how critical a record is to operations of your business. Some information is too valuable to chance being stored via the Internet, while it is alright to sacrifice control of less valuable data to gain the advantage of having data stored in the Cloud. Overall, the benefits of using the Cloud make it a very effective method for giving employees the ability to open needed files, especially if they travel away from the office often. Because it can be used anywhere in the world, precautions are necessary for ensuring measures for protecting data in the Cloud are effective. 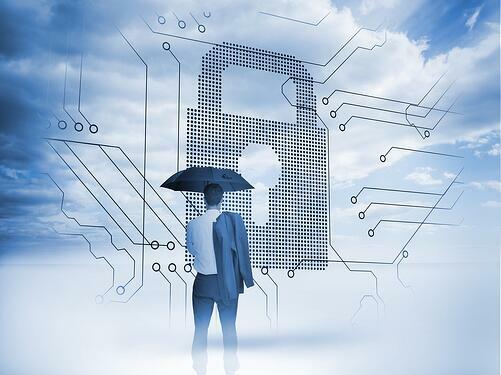 Still seeking advice on the benefits of the Cloud and how to protect data stored there? Interested in learning more about TCS Cloud consulting and assessing the fit for your organization? At Total Computer Solutions, we have years of experience with protecting data stored in the Cloud. TCS can guide you in the right direction with no obligation, just fill out our form here give us a call at (336) 804-8449.